Something that has been causing a local stir recently is the newly re-launched and re-vamped community blog, MedHatBlog (formally referred to as “The Mad Hatter’s Weblog”). They also (probably jokingly/sarcastically) changed their motto from “Impartial and (mostly) unbiased options on Medicine Hat” to “Passionate and shamelessly biased opinions on Medicine Hat”. MedHatBlog has always been known for the great political discussion and commentary, and now with the new one launching in prime election times, nothing has changed. There’s already a bunch of new posts talking about the election, issues, and the electoral candidates. 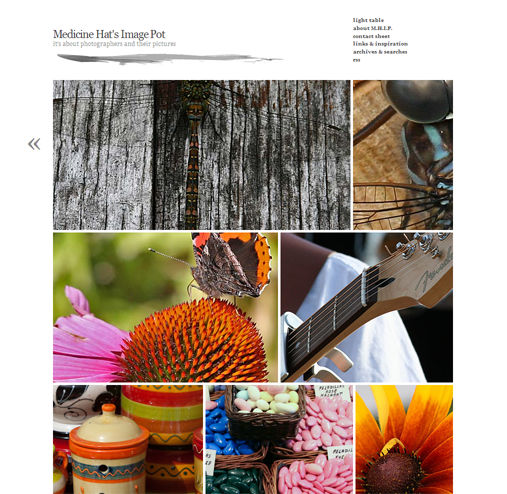 Recently launched, Medicine Hat’s Image Pot is a new and unique website focusing on local photography presented in a unique format on the web. The website uses a very unique and cool WordPress theme for showcasing imagery in a different/less-standard way which really looks great for the photography. A nice touch is also the previous/next arrows to move throughout the site easily. Medicine Hat’s Image Pot is about photographers and their pictures. Our aim is to showcase these fascinating people and their work. We want you to be able to view the world as they see it. As well one of our goals is to showcase Southern Alberta and it’s treasures. This is going to be the place to come to see firsthand all this enchanting landscape has to offer. We hope you enjoy the site and encourage you tell your friends, family and co-workers about us. Over the last few days a website called What’s Up in the Hat? has debuted using the Ning social networking service. I will be running and managing the website and social media presence. We have also debuted our Facebook & Twitter pages this morning. We will be providing updates for events happening in the Medicine Hat area stretching all the way into Southwestern Saskatchewan. Our duty is to be committed to you! If you have anything you want to post on the website feel free to do so and if you can’t drop me a line at Facebook or Twitter and I am sure you can contact me somehow through our main website. We are providing local events, possibly local news coming soon, a blog, a chat to speak with other members who are online, groups for different communities/regions and more! That’s right, the MHPL uses Twitter to post updates and events happening in the Library. It’s nice to see a place you would think would be fairly old-school using this service. Now, even the Medicine Hat College has begun to tweet! I’m told they will begin to post event info, advisor updates and more. Medicine Hat News has started posting links to their top and local stories using the “twitterfeed” web application. Local web design and development company has just started using Twitter to post and will post a variety of things including finished/portfolio work, cool gadgets, internet happenings, and more. The From Womb to Cradle posts about pregnancy, birth, postpartum and parenting information as well as professional events. This local computer store and web development company uses Twitter to post about new stock, technology/computer news and other things. I originally had a very large list here of individuals in Medicine Hat that post on twitter, but it just got to hard to keep up with. So instead, please take a look at who Medicine Hat Media follows (login required). We try to follow everybody from Medicine Hat, unless they have been inactive for months, then we usually un-follow them to keep our list active; however, we do try to keep all the businesses and organizations followed. Well that concludes it, I hope you found some twitterers that tweet in Medicine Hat to follow or friend! Okay, I’m sick of saying Twitter related words now. One thing I did notice was the mass majority of Twitter users also have their own website, in most cases it is another blog which 99% of the time contains their Twitter feed in it. Comment if I have missed you! There have been quite a few Medicine Hat community sites popping up lately, Medicine Hat Media being one of the new kids on the block. There is also some more long-running community sites you might not be aware of (but chances are that you are). This post is dedicated to listing all the blog-like, social, or community based Medicine Hat sites that are out there. I have even posted some very obscure ones I found on my hunt. The concept of this blog is to discuss all things pertaining to Medicine Hat in a candid, mainly factual style with open discussion. Something that you do not receive from the mainstream media. No sugar coating here. We will strive to make at least a post a day.